I did one complete clockwise loop of the island reaching both lighthouses at each end. 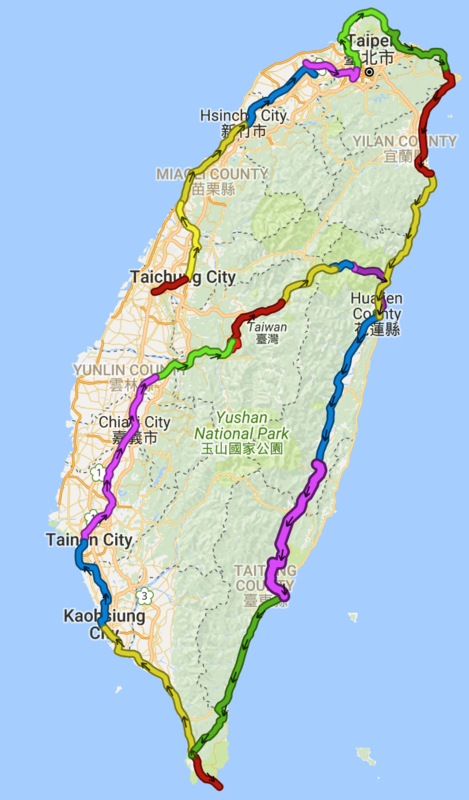 Plus straight across the island to the Sun & Moon Lake and then up to the highest mountain pass in Taiwan at Wuling, 3,275 metres above sea level quickly followed by the awesome 10,700 foot descent down the renowned Taroko gorge, the highlight of the trip even though it was pouring rain and I ended up riding for two hours in the dark; although the amazing Qingshui Cliff section on the East Coast Suao-Hualien road was a close second. I was very fortunate as there had been a very recent landslide which blocked the road, although I snook across 🙂 so I could zig-zag across and get loads of cool pics. 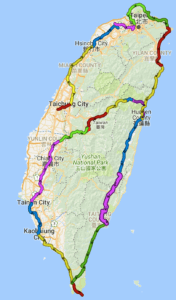 I like Taiwan a lot relatively cheap, my accommodation averaged out at £36 a night with quite a few ‘fancy’ places, food is inexpensive and plentiful with 7-Elevens seemingly around every corner street markets everywhere. The drivers are courteous but watch out for the zillions of scooters in the towns. Roads are well marked for cycles with many super duper special cycle paths. Although the Route 1 cycleway fails to use them! Its more set up for folks who want to bomb around the island in 9 days 🙁 the route manual is here! I met some interesting folks and hope to be able to introduce Sally to Graham & Frances on our next little UK tour.